St. Mary’s County Commissioners Michael Hewitt, left, and Randy Guy and Todd Morgan, far right, present a Preservation Service Award to John W. Roache, MD, second from left; Nicki Strickland; Holly Meyer; and Carole Nelson for their contributions to “Reflections,” a new exhibit at MedStar St. Mary’s Hospital. MedStar St. Mary’s Hospital in Leonardtown has been recognized for its Historic Preservation efforts. The hospital’s “Reflections,” an exhibit of historical artifacts that are related to MedStar St. Mary’s Hospital, has been honored by the St. Mary’s County Historic Preservation Commission for its work to keep and highlight the 106-year history of the nonprofit medical facility. 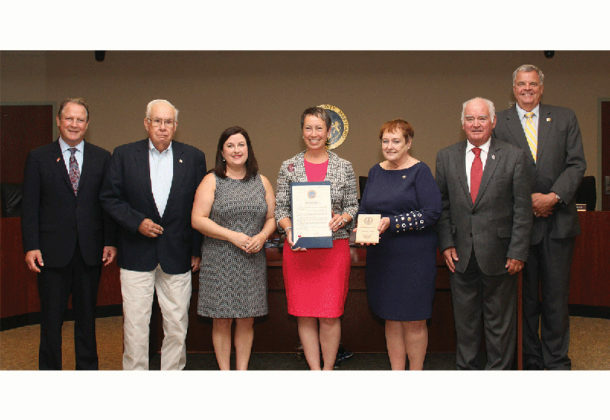 Hospital representatives accepted a Preservation Service Award and proclamation during the St. Mary’s County commissioners’ monthly meeting May 15. The award was one of three that were given in honor of Historic Preservation Month. Unveiled in October 2017, “Reflections” includes historical artifacts that were collected to celebrate the facility’s centennial anniversary in 2012. Linda Lagle, Nicki Strickland, Carole Nelson, Dr. John W. Roache, Pat Wilkinson, and the hospital’s marketing, public relations and philanthropy team worked together to locate, organize, and display the historical photographs, letters, medical equipment, and other items that were donated by physicians, past and present, and community members. The exhibit is dedicated to Dr. Roache, a surgeon and local historian who retired in 2016 after more than 40 years of service at the Leonardtown hospital. The room is open to visitors and is located near the Café at Buena Vista on the first floor of the main building of the hospital.